How is hypoxic-ischemic encephalopathy (HIE) treated? Hypoxic-Ischemic Encephalopathy (HIE), also known as ‘birth asphyxia,’ is a dangerous neonatal brain injury. HIE occurs due to oxygen deprivation and/or compromised blood flow to the brain. When this happens, brain cells die off in a cascade reaction, causing widespread brain damage. If the issue is addressed very quickly after birth, however, the damage can be minimized. What Health Issues Does HIE Cause? Periventricular leukomalacia (PVL). HIE usually involves damage to the basal ganglia, cerebral cortex, or watershed regions of the brain, but it sometimes includes PVL. Recently, a new therapy called hypothermia (brain cooling) has been used to help treat HIE. Hypothermia treatment must be given within 6 hours of the time the baby experienced the oxygen-depriving insult, which usually means it must be given within 6 hours of birth. Hypothermia treatment has been shown to halt almost every damaging process that starts to occur when the brain is significantly deprived of oxygen. The treatment can prevent a baby with HIE from developing cerebral palsy, or minimize the severity of CP. In hypothermia therapy, a cooling cap is applied to the baby’s head, or the baby is laid on a cooling mat. A machine circulates cold water through the cap or mat in order to cool the baby’s core body temperature. This is done for 72 hours, and then the baby is warmed back to normal temperature. By lowering the baby’s temperature, the metabolic rate slows, allowing cell recovery over a longer period of time, avoiding further damage that can occur if normal oxygenation or blood flow is restored too quickly to injured cells. Timing is very important when using hypothermia treatment. The most favorable outcomes are seen when brain cooling is started as soon as possible after the birth injury occurs, preferably within 6 hours of birth. The more severe the brain insult, the sooner the treatment should be started. Hypothermia treatment for HIE also requires that the baby be at least 36 weeks gestation. 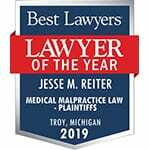 The Michigan HIE lawyers at Reiter & Walsh, P.C. are leaders in the field of birth injury law. We are recognized for our compassionate yet aggressive representation of HIE-injured children. If your child was diagnosed with HIE at birth and is now physically or mentally disabled, or if doctors failed to offer hypothermia treatment to your child at birth, please reach out today. We have helped children throughout the country obtain compensation for lifelong treatment, therapy, and a secure future, and we give personal attention to each child and family we represent. 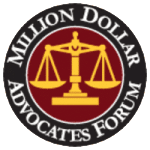 Our firm has numerous multi-million dollar verdicts and settlements that attest to our success, and you pay nothing unless we win or settle your case. Michigan HIE lawyers FAQ: What is the long-term outlook for a child who has HIE? Michigan HIE attorneys FAQ: Does HIE always cause permanent brain damage? Are seizures in a newborn usually caused by HIE? Watch a video of Michigan HIE lawyers Jesse Reiter and Rebecca Walsh discussing the causes of a lack of oxygen to a baby’s brain and how this can cause HIE and long-term problems such as cerebral palsy.